The Wolf Ranch is getting a pig delivered tonight. While it might not seem like a significant event, dinner hinges upon it. Through a series of fortunate circumstances, the Hub and I drove 16 hours from northern Idaho to northern Nevada to pick up a truck and attend our niece’s wedding. This is the first family celebration we have attended since a Mills reunion in 2004, and the first time I’ve been back since 2008 when I had to cut short our vacation for an emergency surgery. I’ve waited for a dinner like this for years. A family dinner. In 1988 I fled Nevada and my own family of origin. It’s taken years to feel settled enough to visit where my estranged family also resides. Generations of abuse, and I broke the cycle. Now that my children are grown, I no longer feel panicked over their security and welfare. What was most precious to me to protect also required my husband to sacrifice his own roots, healthy roots. It’s a bit of a wonder to return here and not feel anxious. And I’m enjoying the company of Todd’s family. I feel unburdened and grateful that his family is my family. Tomorrow the Hub’s mama, M-1, turns 76. I’m writing from her sunny sitting room with its pitched roof, white walls and sheer drapes of sea foam green. Five picture windows open up to the vast desert view of Lahontan Valley, cradled within the towering purple mountains of the Stillwater and Camel Back ranges. The Hub, his father and our oldest daughter were all born in the same hospital. Seven generations of Mills are buried in the sand beneath cottonwood trees in the county cemetery. From where I write, I can see the dairy farm that the Hub’s father built, the irrigation ditches his family helped institute for agriculture, hear the cows lowing and smell the sharp tang of silage and dusty desert air. It’s different from my own roots, but familiar. Gardens tended to supply meals, cattle raised for meat in the freezer, the joy over getting a pig (bacon! ), fruit watered for pies and jams, grains grown to mill and bake into bread. This is why I still grow things in the dirt and insist on knowing where my meat comes from in Idaho. A born buckaroo, after all, has country roots. Today we picked raspberries at the Wolf Ranch. Wolf Mom, the Hub’s youngest sister, is a feisty Nevada rancher with a soft-spoken buckaroo husband and two vivacious daughters who grew up raising cattle in the most difficult buckaroo regions to ranch. Ranching in northern Nevada is not for the faint at heart. Basin and Range country is high mountain desert where the valleys are at the elevation of our mountains in northern Idaho. The Nevada mountain ranges have more 10,000 and 12,000 foot peaks than any other state in the union. The weather is hot by day, frigid by night and dominated by dryness. Cattle range hundreds of miles. Wolf Mom often gets asked if the Wolf Ranch raises wolves — it’s their last name, but she’s witty enough to point to her daughters and say, “Yup! And there’s my two cubs.” She serves on numerous agriculture boards and fights politics that have little concern for American agriculture, let alone the unique growing conditions of a place most people think of as Las Vegas. Buckaroos are the last of the “real” cowboys, pushing cattle across vast frontiers and living off the land. Wolf Mom’s home sits in a beautiful old grove of cottonwood trees on a bend of the Carson River as it winds its way through sand dunes and sage to dump in the Carson Sink. It’s a landlocked river that is the heart of agriculture in northern Nevada. Raspberries grow in three thick rows that dwarf my humble canes back home in Idaho. M-1, Wolf Mom and I chatter over the hum of bees, careful not to disturb great orbs of spiders. We wear picking buckets Wolf-Mom makes out of large yogurt containers and baling twine. The Hub and Sis, his oldest sister who I claim as my own, are the only two Mills of their generation to leave Nevada and live elsewhere. Sis made the apron I wear as I gently tug ripe raspberries from the prickly canes. I feel connect to her and the plucky females in the family. You don’t sustain yourself in a region like this without being hearty and having heart. In the time I’ve reflected on this incredible moment, this presence in a place I didn’t think I’d be both physically and intellectually today, I’ve learned that the pig is not on his way to the Wolf Ranch. Dinner is at the Mills homestead. M-1 rolls her eyes, laughs and returns to bustle in the kitchen, jamming berries, baking bread and preparing spaghetti for the 14 of us that will gather here tonight in this very sitting room, filled with tables for playing pinochle, sharing meals and allowing a corner for the return of the prodigal son and his wife. Or maybe I’m the prodigal daughter returning to the family that has nurtured me well beyond my own. In a week filled with unexpected blessings, several more relate to my writing journey. M-1 has a twin sister, M-2 and she has been my dedicated patron, encouraging, reading and getting me off to LA, believing I will publish my manuscripts. She arrives tomorrow from Arizona to celebrate her shared birthday. I get to see her! Today, after picking berries, M-1 took me to where she volunteers as a book binder — the county library. I got the full tour and serendipitously met the director. I asked for her insight on book distribution (a huge concern of mine if I don’t go the traditional route), and turns out she used to be a book buyer and knows the industry. Her advice was in perfect timing and I will use it to make decisions after I go home. She also encouraged me to work with my own local library. This week, our prompt takes on returning to a place of origin. Sometimes, it’s not our own, just like this is not my own roots, but is my husband’s. Still, it is a return. Think of immigrants or pioneers of old. They may never return, but often their descendants return to search for homeland roots, for connection. Sometimes, we visit a new place and feel at home, grateful for what it has to offer — a better life. No matter the circumstance, think of a return. Respond by October 6, 2015 to be included in the weekly compilation. Rules are here. All writers are welcome! I’ve often wondered at how Sarah Shull felt when she returned home to North Carolina in her later age. She escaped shunning only to return to a family that still harbored ill-feelings toward her. Many believed she had Cobb’s gold — a myth that still surrounds both of them. Logically, if she had had wealth, Sarah would have never returned “home.” She died in misery, nearly a century old. She is buried next to her and Cobb’s daughter who died at 16 months. It’s her homecoming that I’m exploring in flash this week. The family cemetery remained on the hill. Father’s grave next to Mother’s. White stone spoke their ages. The place itself spoke of Father’s ambition to prosper. Shulls Mill. At one time the name affixed firmly to Father’s store and grain mill with its wooden paddles dipping into Watauga River. Surrounded by tree stumps, a scattering of clapboard houses and a paper mill belching smoke below the hill spoke of the town’s ambition. The other grave. White, weedy and alone from the rest, it belonged to her baby. An old woman now and she still felt like an erring daughter. 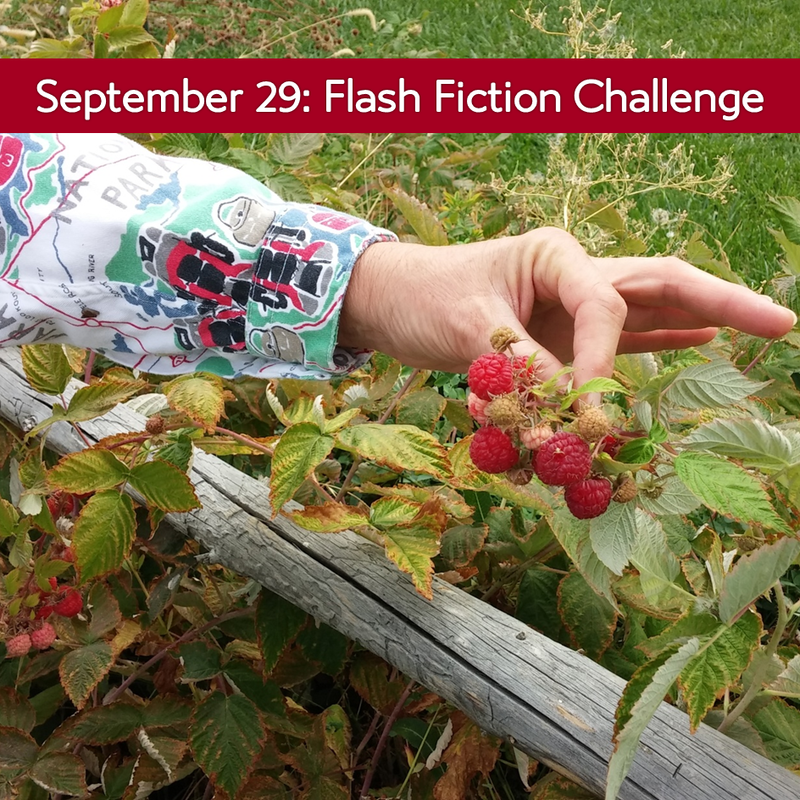 By Charli Mills in Flash Fiction Challenge on September 30, 2015 . Wonderful writing, Charli! I could see myself there! Thanks, Noelle! I understand that the cemetery still exists, surrounded by modern homes. I agree with Noelle. You have painted Nevada, Wolf Ranch and its occupants so well I feel I am almost there with you. I also feel as though I am stepping back in time as the life you describe I relate to probably the fifties. I’m glad you have reached a point where you can go back in comfort – a fantastic place to have reached. The spaghetti I’m guessing will be fantastic and I would give my eye teeth for some of those raspberries. I will return with my contribution then read your flash. I don’t like to read any before I have let my mind do its work. The spaghetti was so good, as was the garden fresh salad! It’s a good visit. Glad to hear it Charli. What a poignant portrait you have painted of Sarah visiting the cemetery. It said it all in that last sentence. I can relate to those feelings living on. That little grave alone really made me sad also. You said so much about her home in those 99 words. Often it is hard to see the obvious in our own families. Your flash brings out that sadness of old wounds. bandages.” After finishing the last line, I laughed envisioning how many people try to. The dollar store is never the place to go when talking about anything medical. That was the intent. Though I’m sure the person going to the Dollar Store would be insulted. It’s the whole getting the A for effort that they might think is the real value. There had been weekly meals – home cooked – almost always one of the dishes was one of my favorites. Mom had been the family glue. Dad- always on the outside listening in. That was his social gifting… Listening. Without Mom… we were just seven islands circling – desiring to connect- but the center of family had been removed. Dad had been bread-winner. He had out-sourced himself into a world of farming and small engine mechanics and work as a postal carrier. He had so many varied talents. But social interaction was not one of them. A great comparison of Mom and Dad’s roles. If there were a few less islands, I grew up in a similar dynamic. I constantly felt like I walked in circles. Wow, poignant flash. The last line gave me chills. Thanks, Pete! I’m finding that these gaps I have in Rock Creek are coming to life putting the idea in flash fiction. Ben reached his wife’s cheery voicemail as he neared the warzone at the house. He was past regret. For confronting the noisy teenagers. One blind swing in the night. Last week. A lifetime ago. Headlines. Reporters. A backdrop of discontent. His tearful visit with the boy left uncovered because conflict outsells resolution. Ben left a message. He loved her. Then stepped out into the night. Box vans. CNN. FOX. The big boys, aiming a lens at the malcontent. Ben headed for his home, ablaze with protests. The viewers wanted blood. All he could do was give it to them. “His tearful visit with the boy left uncovered because conflict outsells resolution.” Isn’t that a true statement of news in America. I really like how your style of writing this piece reflects headlines, yet builds the story behind them. Yikes. Loved this, but it creeped me out at the same time. Very moving and sensitive, Pete. There was a story here in the local news a few years ago of something similar, a good teacher pushed beyond his own limits and hitting out. I bookmarked it in my head as something I might write about, but you’ve done it for me. Fortunately here the case was more sensitively handled (I’d like to claim that we always manage it better in the UK but I don’t think that’s the case) and the outcome was less extreme. But a complex area. One breath at a time…but don’t stop! Beautiful, though sorrowful, flash! The return has felt like that! Heading back home to Idaho, feeling the weight of years off my shoulders. Refreshed. Renewed. Reconnected to roots. Returning is not always easy and as we get older. The familiarities are often gone. Yet, we still feel a need to somehow keep connected to that part of yesterday. Tag on horseback on the wild hay meadow. Ice skating on frozen ponds. Playing kick-the-can. Bonfires, guitars and sing-alongs. The gathering becomes silent, reflective in their thoughts. Knowing it’s time to close for another year. They all promise to return with their memories. The connections that remain feel like a renewal. I’ve experienced your flash all week. And seen my father in law join that ‘gang’ every morning for coffee! My husband met up with his own this morning and I wondered, when did WE grow old? I like the details expressed in your flash. You have a way of capturing the cozy nostalgia in your writing. Thanks, Charli. I hope your week away has been good to your and for you. Safe journey. I could never be a member of the Do You Remember Gang. The second somebody starts playing that ‘Do You Remember’ Game, I tell them I lose because I never remember. Some of the games they played sounded fun. Tag on horseback could be interesting. I do so love your intros, the way you so beautifully let us into your life, little nuggets of moments so vivid and picturesque it is as if we were right there with you. ❤ Sometimes the way you describe people, I feel like I actually met them!! He clasped my hand and tugged. Insistent I knock on the door. “Wait,” I breathed and squeezed his hand. He touched my rounded stomach. A wave of nausea sloshed at my insides. My chest tightened like a vice closing over its prey. I threw my cardigan off, desperate for air and rubbed at my face. I agree about Charli’s writings. You developed the character and scene in a vivid way with few words. I needed some more words to see what exactly is wrong with mom. These moments are tense and you’ve drawn out that feeling. I see the mother changing her mind mid thought and embracing the new life she might have with the daughter and future grandchild. Thanks Charli, I so wanted a few more words! But such is your challenge! Hope you’re not too shattered after your epic road trips! How is your writing going? I know what you mean! I’m getting back into my novel by condensing to 99 words and then using the ideas to fill in those gap areas. A bit pooped, but family followed us back so I’m also excited to continue our visit. Interesting how you are combining your writing and sport interest. Maybe you could develop a character that bridges the world’s of MMA and education. I am also from the high desert of northern Nevada! Wonderful word picture. What a small world out west among its vast frontiers! I love the way you write about the hub and his family. It sounds very warm and loving, the way every family should be. I am so pleased that you found him and his, and were able to break the chain of abuse in your own birth family. Your children are amazing young people of whom you must be very proud. Your flash is great too, as is the supporting information you shared. I love the way you are getting to know these characters so intimately: their hopes and dreams, their fears and anxieties, their pleasures and their sadnesses. You have gotten to know them as real people, and you share that reality with us. The stories are always a pleasure to read. I’m very proud our kids, yet this trip also showed me good roots. It also have me some good ideas to apply to Rock Creek, like that strong connection to sewing. I don’t have it, but Mary McCanles does and so do the women back in Nevada. You may not have the gift of sewing with needle and thread, but you weave a good story and manage very well to tie the threads together, sewing them into a complete whole. Like my Mum’s button tin used to be – a collection of a great assortment of buttons – your mind is a collection of ideas ready to be used whenever the situation arises. Beautifully written, as always, Charli. I do empathise and identify with that difficulty of returning “home”, so glad you’re now able to give yourself the good bits of that territory. Oh, yes, forgot to say I LOVED that last line of your flash: perfect! Ah, that’s an insight to how our writer-minds work through a subject — sometimes I think a prompt is playful and we end up with heavy stories. I think many of our disappointments (about returning home) are rooted in expectation. Hello everyone. In my contribution to this week’s challenge, Ed and Edna return to their humble beginnings. Hi Larry! I think Ed and Edna carry their humbleness with grace throughout their stories. http://geofflepard.com/2015/10/05/home-heart-hearth/ sounds like you had a whale of a time rather than a wail of a time. Hope you aren’t too exhausted! Perfect capture of eeriness, Geoff! It was a whale of a time, immersing in the farm and ranch rhythms! The exhausting part was driving back 16 hours in separate vehicles (we went to pick up a truck). I was ready to wail at about hour 14! Thanks for the prompt, Charli! Hello again everyone. Sorry I’ve been gone so long. Looking forward to reading your contributions this week. She held the real estate flyer and looked around the front hall. The pictures were awful. Jewel toned carpets and floral patterned couches. Her mother’s decorating sense stuck firmly in a previous decade. But the house smelled just as she remembered it; a blend of potpourri and Sunday dinner. Comfort food and pretty vases filled with coloured wood chips. So long ago, she had left without looking back. Stormed down the steps determined to show the world she could be something different than what she had come from. She had learned since then you could never leave home behind. Hi Georgia! Always good to see you on the page! The idea that we can become something more than where we come from fills many hearts and minds. We either reflect or reject it, but either way it shapes us. I almost forgot to come back and link to mine! One day I’m sure I will forget. While WordPress is supposed to send a pingback, I can’t see it here and would be fearful of relying on it for that reason. 🙂 As always, thanks for the challenge. Jean stared at the little white, two-bedroom rental that she and Charlie lived in while they were married. All eighteen months. Seventeen years had passed since the place was her home. Slate siding, picture window in front. The landlord let her in. How are things always smaller? The metal kitchen cabinets looked so tacky compared to what she remembered. Thank heavens – no more avocado carpet. “I wish we had a renter like you now,” the landlord said. “I know you’d care for it.” I would, I did, thought Jean. How could this little house have held so much drama? That’s so true, how size is relational. We remember rooms and issues being bigger. So happy to finally be back at this and I profusely apologize for my absence and silence in commenting and participating. The past month has been a whirlwind of dealing with my father-in-law’s illness, leaving next to no time to write. Which only ends up only hurting me. I NEED to factor in time to write. There is nothing more cathartic. Writing provides a much needed escape, providing a chance to throw myself into another world, another story. A much-needed break from reality. This prompt reminded me immediately of my own return home after refusing to take the advice of my parents, and moving to Florida for a young man I was “in love” with. Ah young love, there is no persuading otherwise! Needless to say, my parents were right and I came crawling back on my hands and knees after a few failed years. I was terrified of hearing countless “I told you so’s” and was prepared for lecture after lecture. My parents just held me, hugged me, cried with me. They were simply overjoyed to have me back. Christina, it is a whirlwind dealing with the illness of a loved one. We need both space to cope and the ready return to the things that reconnect us — like writing! So, welcome back! I like your story that reflects a parents’ forgiveness and understanding of how we often learn through our painful mistakes. Love your post and your prompt. So many delicious possibilities with this one… I just love your flash because you took me right there to that cemetery, the way Sarah is feeling, and terrible sadness of that lone, ‘weedy’ grave of her baby and of her terribly sad story. Fascinating about the gold, but how rumours grow over the years causing such bitterness when there should be none. So glad you got your wonderful homecoming at Wolf Ranch (love that name so much!). Again, your beautiful wrting had me right there with you and so it was lovely to enjoy the stay and pick raspberries and relish the peace and quiet. Ha, ha! There’s getting to be a groove to our fence sliding!